Welcome to our CAERvest and Automated External Defibrillator (AED) locator. Our goal is to provide a detailed map of the life saving equipment, for public availability across the UK, and also in other regions of the world. By simply inputting your postal code, the locator will show you on the map where the nearest available CAERvest or AED can be located and accessed. A red heart indicates limited access; a green heart indicates 24-hour access; a blue and red heart indicates the location of the CAERvest and its availability. An information bubble will inform you of the times the AED or CAERvest will be available at that location. At the location, a prominent sign of a green or yellow cabinet will mark the AED or CAERvest. This will differ from place to place and country to country. If you have recently installed a defibrillator or CAERvest at your place of work or home address, and you wish it to be marked on the map for public access you can do this by calling our automated defibrillator helpline on the free phone number marked below. Our helpline is funded solely by kind donations from the public. The service is there to aid our emergency services, and make people aware of locations and availability of the AED and CAERvest. The general public can access the devices by obtaining the code from the emergency services or the number on the cabinet. They could also be used by the emergency services, such as first responders and the air ambulance. There is no charge to anybody needing to use either piece of equipment. They are there for the public in an emergency; they are simply there to help save lives. The AED or CAERvest marked on the map may have been installed by ourselves (HESE) to help aid the air ambulance, the police and other emergency services; including members of the public. This equipment has been funded by our work in the community. In the event of a suspected sudden cardiac arrest (SCA) or heatstroke, the observers and persons present must report immediately any incident to the ambulance service by dialing 999. This emergency number varies from country to country. We will provide a further list of these below for people who are travelling from worldwide. Does not confirm that these are the only AEDs available within your local area. Installations of defibrillators can be made by other parties and organisations, and further placed at available public access points. We would recommend wherever you live that you acquaint yourself with your nearest public access AED. We also recommend you obtain this through the ambulance trust, NHS medical practice information related to your nearest checkpoint. We advise this so you are prepared in case of an emergency. 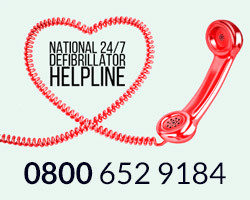 The helpline is only an AED information line! You must not call us in an emergency under any circumstances. If you have an emergency please remember to call 999 or your relevant emergency service.